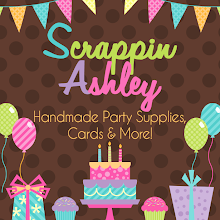 Scrappin Ashley: TSB Blog Hop! Hey Everyone! Thanks for stopping by today...if you came from April's blog than you are on the RIGHT track....if not then start from the beginning at Aletha's blog so you don't miss any creations!! This time the blog hope theme is BACK TO SCHOOL! Wow..it's going to be August and kids will be going back to school any time now. I dread the day when Aiden has his first day of kindergarten...it will be bittersweet and hard to see him go! I created a card with the TSB Bus digi image and colored it in with copics. 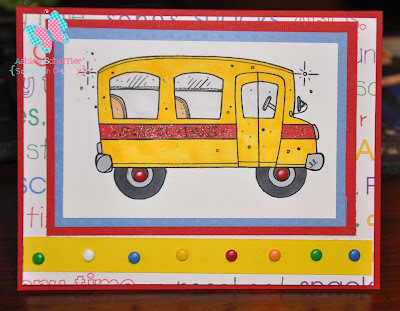 I also used the red Copic glitter pen and colored in the red strip across the bus! You can't really tell but the pattern paper is school themed and has school words all over it. For an extra touch I added brads...primary for typical school colors! I had to decorate the inside as well and used a scrap piece of that pattern paper inside! 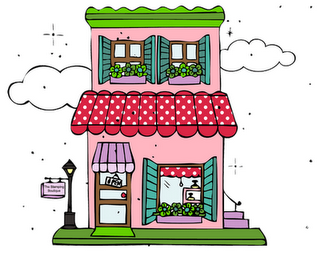 Time to head on over to Collette's Blog for more creativity! I love the bright colors! Very cute digi, TFS! Can't wait for that bus to arrive...CUTE. EEEeeeeeeeeeekkkkkkkkk - HOW CUTE IS THAT BUS??? Love it; what a great card!!! I LOVE the bus!!! I have an actual love hate relationship with buses in real life (lol) but this is SOOOO cute! I really like the red sparkly stripe down the middle. Fantastic card. Adorable card, Ashley. And don't worry about Aiden. You'll love having a little one in school. It's so much fun. Wow, this is a great card. I love the added sparkle on the bus. TFS. I think the brads add just the right touch! Adorable! What a gorgeous card, nice colors had you used. I love your colors and coloring. Fantastic job! Love the card. The brads were a cute touch! Those brads on the wheels are so cute, Wonderful job with your card. Cute card...love the look of the glitter Copics...tfs! Love it!!! The bus is so cute. I don't have any little ones but this is just so cute. Love the colored brads along the bottom! You brought back the first day my babies went on their first school bus ride :) Great coloring. You did a beautiful job with the bus, I like the red sparklie stripe too and all the bright colored brads! Ashley this is so cute!! Love the primary brads too! I love this bright card! What a fun image. Great card!! Love the bright colors and the inside looks great!! Hugs! Love the bright colors and the brads on the bottom! Some mothers just love the sight of this little yellow bus! Cute. Thank you for all you've shared! I can truly say you are one of my inspirations! You so willingly share information and for newbies like me, it's priceless! For this card, I LOVE the layers of the mats and papers. For some reason, that seems to be one of my biggest stumbling blocks and this is a perfect example of coordinating colors and papers!